The Story of "Emma's plaid"
In March 2012, my husband Mark and I went to a local shelter to make a donation. As we do every time we go, we went in to talk to all the babies and tell them that they will get a forever home soon. Mark called me from around the corner and I peered into a cage in the very back. 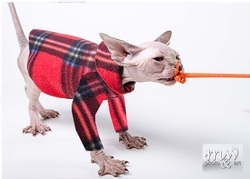 There, scared and confused was the most amazing little sphynx cat, Emma Leigh. We asked to hold her, and 2 hours later, little Emma was on my lap riding home from the shelter. Her owner decided to surrender her because she became pregnant and did not want to have a litter in the house, her loss and our gain. In the next year and a half, this little girl changed our lives forever. In August 2013, Emma wasn't feeling great so we took her to her vet, we figured it was just a URI (upper respiratory infection). The vet did some checking and blood work and then sent us to a specialist. Confused, we then understood immediately when we got the diagnosis, lymphoma. We were devastated!!! The next 10 months were a fight, with chemotherapy, surgery, visits to the vet every month. The vet said that getting Emma a friend was a good idea so along came MiniE (her full name is Mini-Emma). Emma in her SLINX and plaid pajama getting her cancer treatments, then resting at home. In February 2014, we heard the words we had been dreaming of hearing...REMISSION!!!! We could not be happier, we celebrated and life resumed! Then, in May 2014, Emma started acting sick again and we feared the worst, we took her in and after several scans, the cancer was back, this time, with a vengeance. After long, hard discussions, we knew that the best thing for our little girl was to keep her comfortable until the end. The end came on 6 June 2014. She was in my arms when she was put down and the pain I felt was nothing I ever felt before. During her battle, Arie was there for me, giving advice, and she had sent me a plaid shirt for Emma. Emma had loved it and wore it all the time during her treatments. Emma was honored to have her own line of cloths and that a portion of the proceeds are being donated to the research of feline cancer. Always in our hearts, but never forgotten, Miss Emma Leigh left a paw print the size of earth!!!! I'm honored to now have the whole "Emma's Plaid"
Little Delilah has now joined MiniE and the family, and to model "Emma's Plaid." What began as a small gift from me to a family struggling with the sadness of having a beloved pet get cancer has become a beautiful expression of love. Now "Emma's Plaid" is availble in our traditional EZ Pajama, Envelope Bed, SLINX pet sling and a long sleeved pajama too. "Emma's Plaid" products are made from high quality anti-pill tartan fleece, and made to order at the Simply Sphynx studios in San Diego.